All of our horses are AMHA and/or AMHR registered and are up to date on shots, worming & farrier. 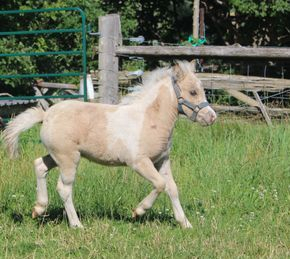 A 25% nonrefundable deposit will hold a foal of your choice until weaning time at approximately 4 months of age. 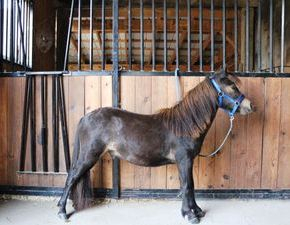 Once a foal is weaned, board will be charged until paid in full. ALL horses must be paid in full before leaving the premises. A 13% HST must be charged on all sales. We will be happy to honestly answer all of your questions and send any photos you require. We reserve the right to screen potential buyers and to refuse sales to anyone that we feel will not provide a good home for our horses. Sales list and prices may change without further notice. 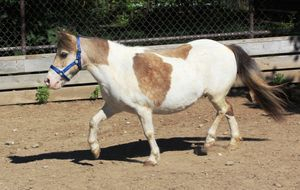 Denver is a quiet gelding ready for something to do. He has color to boot, that would stand out in the show ring. Hate to see this guy go , however can't keep them all. Will post an UTD photo when shed out completely. Is UTD on ferrier, worming and he also had his 4 way and rabie shots in May . This solid black bay colt is true gem and he measures approx 32" , he would do well in the show ring or in the future for a driving horse. A very friendly horse and has been handled a lot. Halter broke and leads very nicely. Frazer is looking for a new home, as a gelding, he had his 4 way shots and rabies,UTD on worming and farrier. Sable is offered for sale to a good home only! 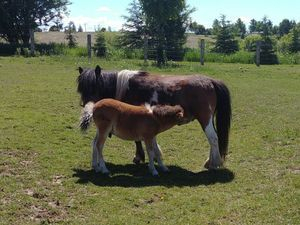 This mare has a very quiet, friendly temperament and passes that on to her show quality offspring. Reducing my herd and want to keep a few of my fillies. UTD on farrier , worming ,5 way shots and rabies. NOTICE! Sable had a stud colt, they will sell as a pair or separate, when colt is weaned. This mare is looking for a new home, she had a beautiful stud colt which I am wanting to keep for a future sire. After foal is weaned she is ready to go. Down payment will hold her until ready to go. Desperado is a proven mare that has left me some awesome foals, gets along with every one in the herd. UTD on farrier , worming ,5 way shots and rabies.